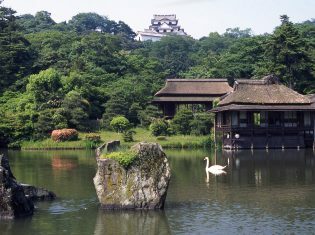 In 1931, pastor and English teacher Percy Smith built Smith Memorial Church Hall near the castle moat to memorialize his parents, with the help of carpenter Shosuke Miyagawa. 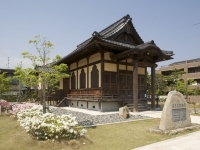 It's exterior is constructed in a similar style to many Japanese shrines or temples, but its beams and doors feature more traditionally Christian motifs, such as grapes and the mark of the cross, making for a very unique architectural style in this Japanese-styled chapel. Following the demolition of the building in 1996 during a road-broadening project, a group of Hikone citizens and Shiga University staff purhcased and reconstructed the hall. Following reconstruction, Smith Memorial Hall was reopened with a special cermeony on March 25th, 2007.